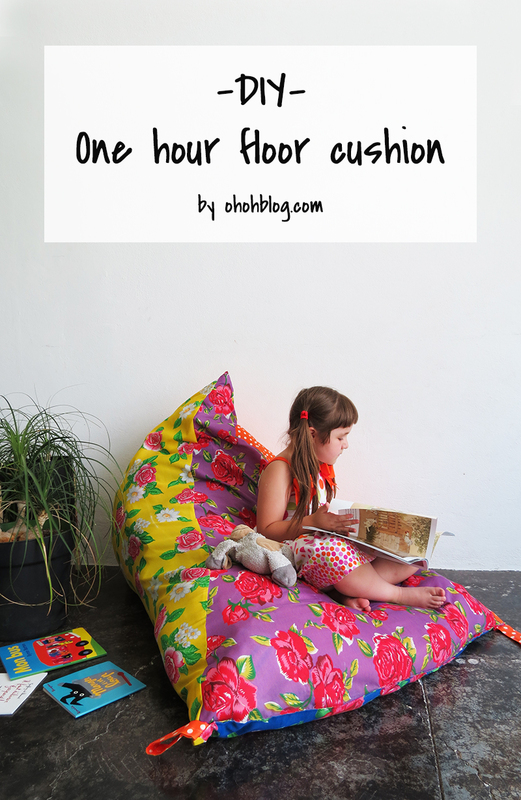 It’s not the first pouf or floor cushion I sew but it’s definitely the easiest project! You basically just need to sew 4 triangles together! I made it for my kids. They can use wherever they want from the bedroom to the backyard! 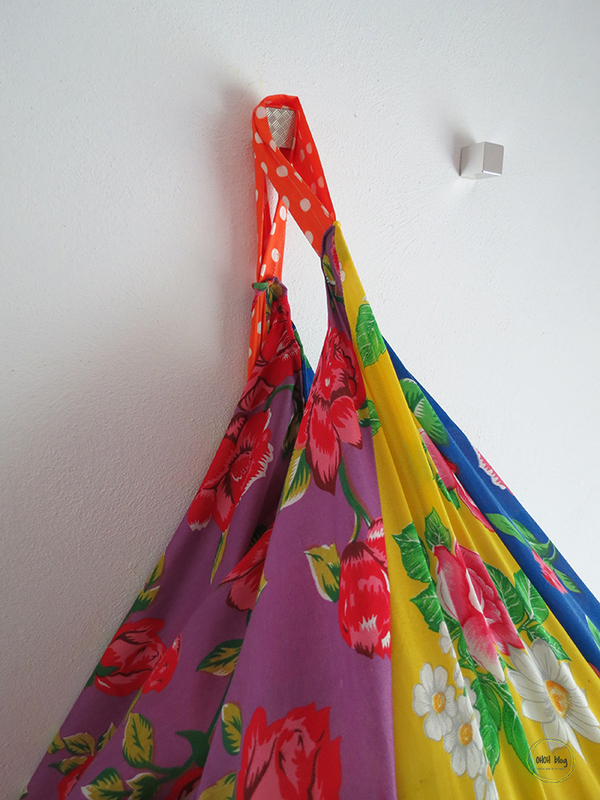 So picked some colored and flourish fabrics, a little touch of kitsch once in a while make me happy! It’s a prefect project if you are a sewing beginner. You will need 4 yards of fabric, one yard of every color. Preferably choose a fabric thick enough to withstand a floor use. And a lot, I mean A LOT of foam filling! 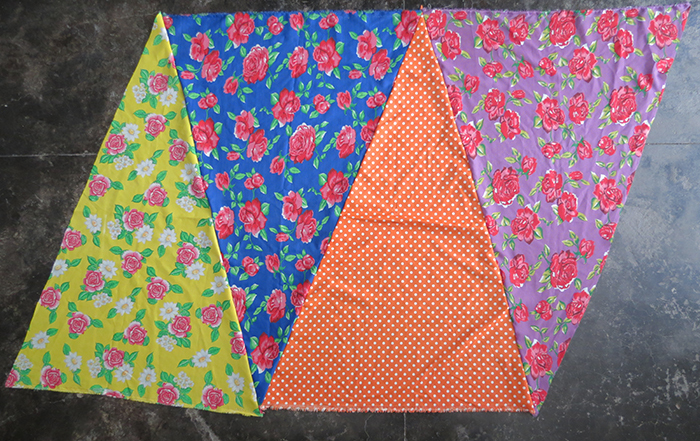 Cut a triangle out of the fabric yard, measure the middle of one side to place the triangle tip and trace two lines to each opposite corner. 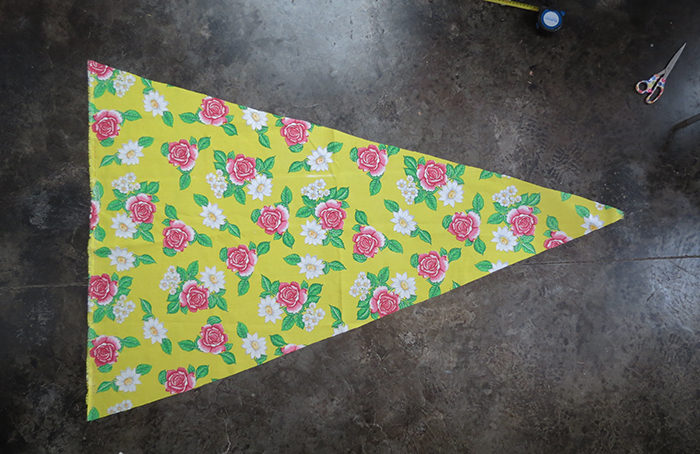 Cut out the triangle and repeat for each fabric. The base of the triangle is 1 yard long and the high of the triangle is 1 1/2 yard. In metric system is 1m for the base and 1,5 m for the triangle high. 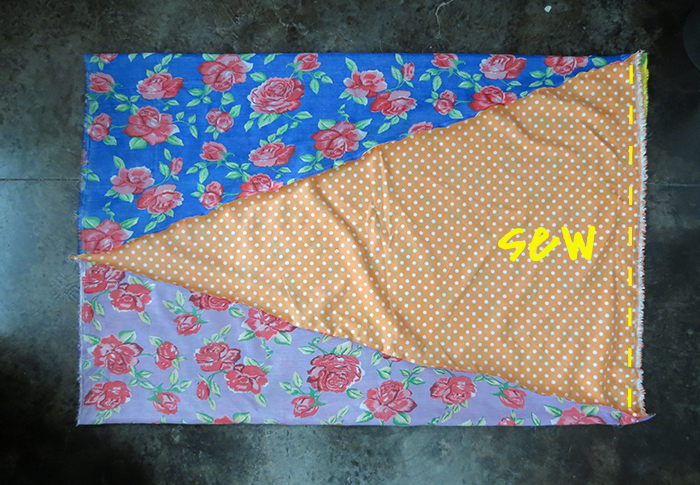 Once the 4 triangles are cut, sew them together. Place one triangle on top of the other, right side on right side. The tip of one must be on top of the edge of the other. Sew the side and repeat with the other two. 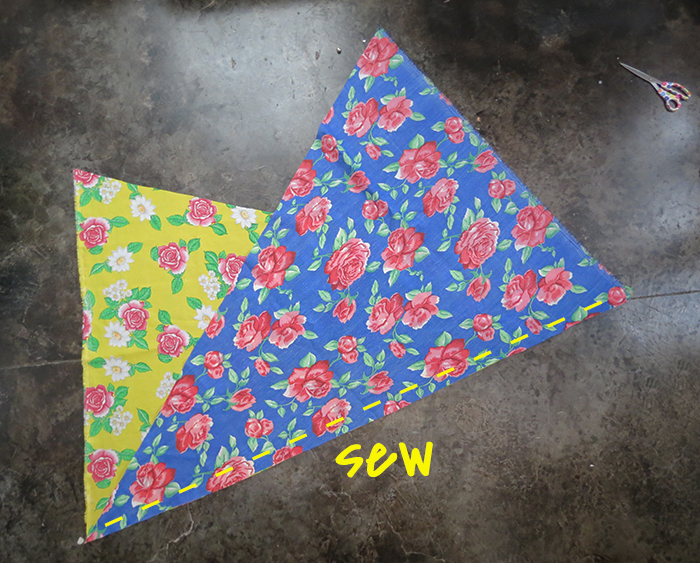 Once the four triangles are sewn and form a rectangle shape, sew both edges together. 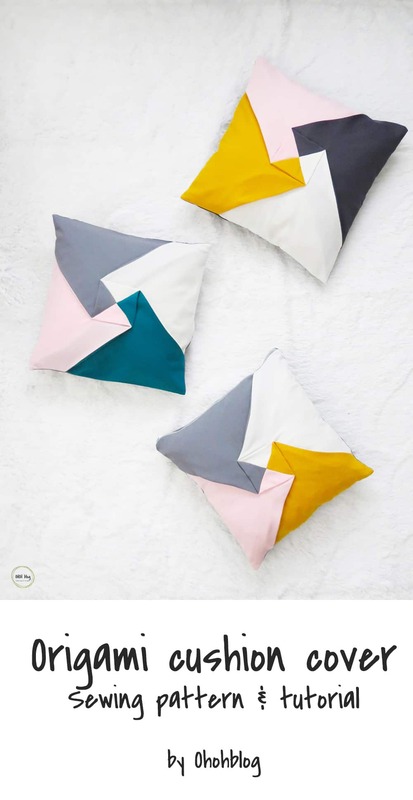 Close one side sewing two triangle edges together, and fill your floor cushion with foam filling. Once you are done filling the pouf sew the last side. 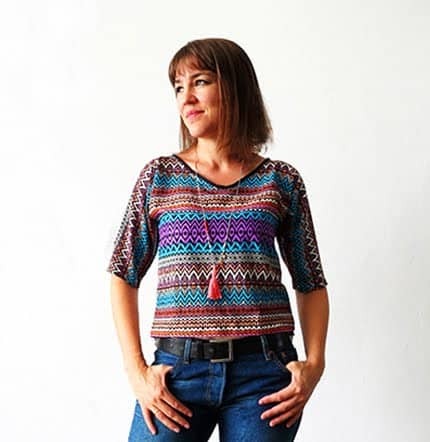 You can use your sewing machine (faster…it’s what I did) or hand stitch it for a nicer finish! I wanted a way to store it or at least to have the floor cushion out of the way when cleaning. 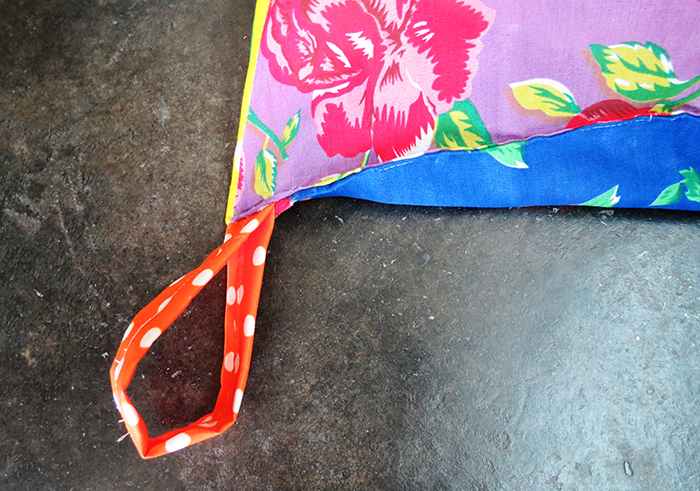 So I add fabric ribbons in two corners of the cushion. You make a loop and you sew them with the edge. You will have to strength the seam a little to be sure the loops can withstand the cushion weight. Cleaning Tips: There are many ways you can clean your non-removable cushions such as vacuuming, steam cleaners etc. A vacuum cleaner with upholstery attachment performs great for general cleaning such as removing pet fur, long hair or dust from the cushion cover. For thorough cleaning; steam cleaners are very effective, but it’ll make your cushion cover dump as it uses heat to sanitize. So you just need to dry it after cleaning, using fan or sunlight. A cosy nook to read her favorite books! Wonderful!!! Thank you so much Anne! What did you fill it with? Love it!!! Thanks! 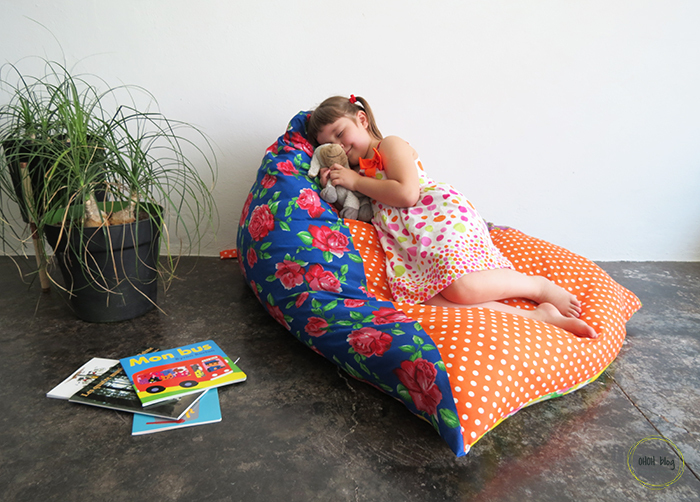 I filled it with cushion foam filling…then I ran out of foam and grabbed all the old or unused pillows and I put them inside too! Great idea, super cute and easy! So for the filling, you cut up regular flat foam? Or are foam pieces available anywhere? Hello, I used cushion filling (polyester fiberfill)but the foam lost a little volume since then. So I will have to add more. Maybe it will work better with little pieces of polyurethane foam…I think you can find it already cut! 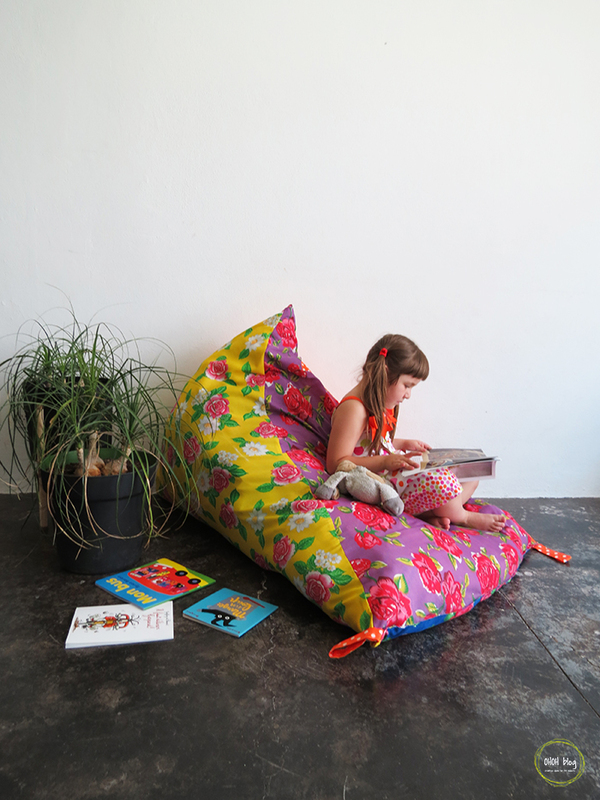 I will never have the patience to do it, it's a realy big cushion to fill! You can find already cut foam at Joann’s but it would take a lot of it. Hello Amaryllis, I just loved this pouf. 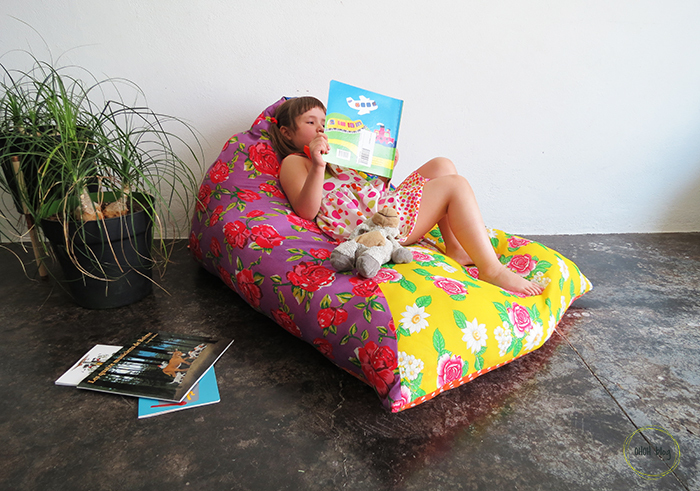 I am tempted to use your pouf project with my 8th grade students here in Brazil. Would you be so kind and send me the measurment you use dor you're beautiful daughter? Thank you! Hello Katy, so sorry for the delay of my answer! 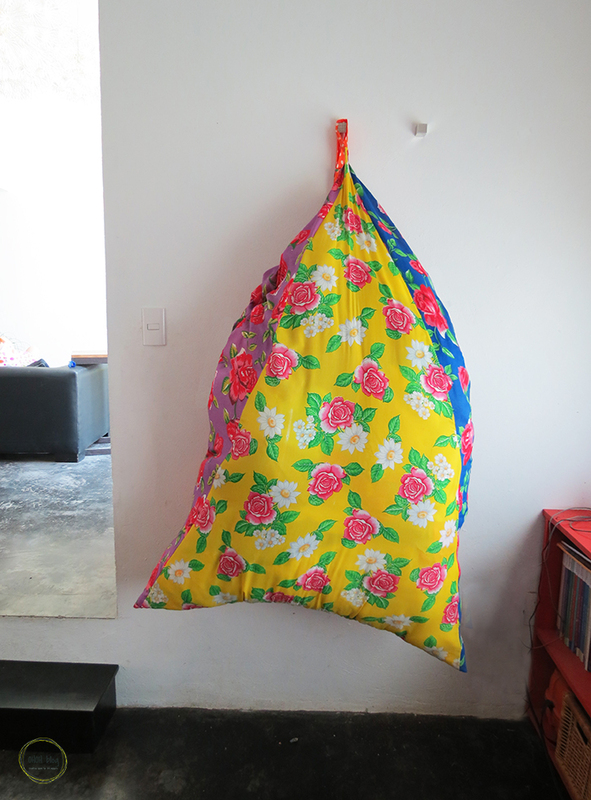 Each triangle have a base of 1 meter and a high of 1,5m, you will need four of them to complete the pouf. 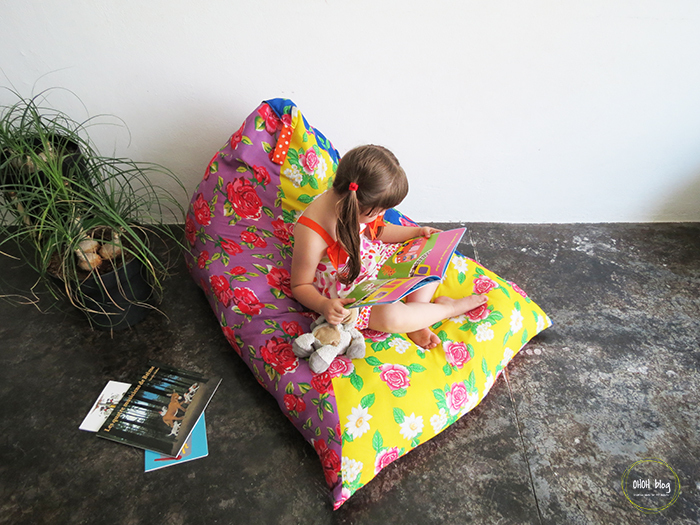 Also a good alternative to fill the cushion is to use small pieces of scrap fabrics. Have fun sewing with your students and let me know how it turns! What kind of fabric should I use ? Hello Bernadette, as the cushion will lay on the floor you you need a thick fabric. 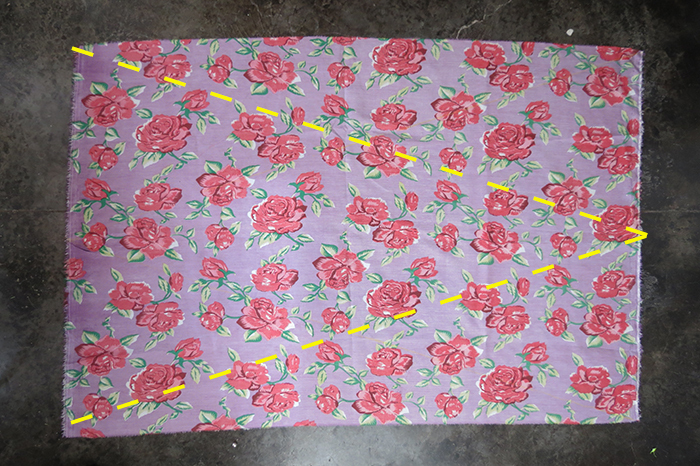 Any home decor fabric will work, I like to use thick cotton because it’s easy to cut and have fun design.